It takes a 15-minute drive from the property to New Kuta Golf Course and the famous Jimbaran Beach. Getting to Bali Denpasar International Airport will take around 25 minutes by car. 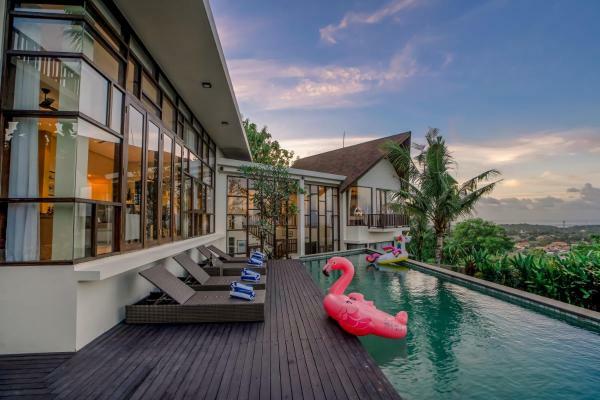 Located just an 8-minute drive from the iconic Garuda Wisnu Kencana Cultural Park, Jimbaran Sea View Villa offers spacious and elegant self-catering accommodation with a private outdoor swimming pool, free Wi-Fi access throughout the entire property. Guests enjoy complimentary return airport shuttle along with daily free 8-hour use of car with driver, excluding gasoline. Other facilities available a this property include free daily housekeeping service, and free private butler service. Massages, laundry service, car and bicycle rentals can be arranged at additional charges. Guests staying at Jimbaran Sea View Villa will find a separate living room fitted with a flat-screen TV with DVD player and an iPod dock, a dining area, and a well-equipped kitchen. There are also washing machine, ironing facilities, and a BBQ facility. Each bedroom is air-conditioned and also comes with a fan, wardrobe, a personal safe, desk, seating area, a flat-screen TV with DVD player, and an en suite bathroom featuring shower facility, hairdryer, and free toiletries. Featuring sea view, this villa is fitted with air conditioning, a flat-screen TV with satellite channels, a personal safe and mosquito nets. The en suite bathroom comes with a bathtub and is stocked with exclusive amenities. Guests enjoy free use of a car with a driver for 8 hours, excluding petrol. Please note that the property requires a deposit payment via bank transfer or PayPal. Staff will contact guests directly for payment instructions. Guests booking the 6-person rate will stay at Three-Bedroom Private Villa. Guests enjoy free use of a car with a driver for 8 hours, excluding petrol. Please inform Jimbaran Sea View Villa in advance of your expected arrival time. You can use the Special Requests box when booking, or contact the property directly with the contact details provided in your confirmation. Up to three children under 6 years are charged IDR 400000 per night when using existing beds. All children under 6 years are charged IDR 400000 per night for extra beds.